"Ölüm Adası" ("The Bribe") by Lee Falk and Fred Fredericks, part 2. 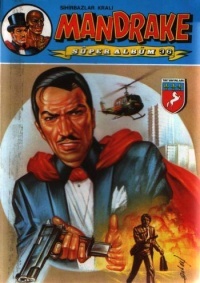 "Büyük Savaş" ("The Underworld vs. Inter-Intel") by Lee Falk and Fred Fredericks. "8 Çetési" ("8") by Lee Falk and Fred Fredericks, part 1. The cover was used first time for Mandrake Albüm #126. This page was last edited on 28 September 2014, at 10:38.